This data set provides estimates of aboveground biomass (AGB) for defined land cover types within World Wildlife Fund (WWF) ecoregions across the boreal biome of Alaska and western and eastern Canada, roughly between 45 and 70 degrees N. The study focused on within-growing-season data, i.e. leaf-on conditions.The AGB estimates were derived from a series of models that first related ground-based measured biomass to Portable Airborne Laser System (PALS) LiDAR measurements, and a second set of models that related the airborne estimates of biomass to Geoscience Laser Altimeter System (GLAS) LiDAR canopy structure measurements. The GLAS LiDAR biomass estimates were extrapolated by land cover types and ecoregions across the entire biome area.The study compiled remotely sensed forest structure data collected in June of 2005 and 2006 from the GLAS LiDAR instrument aboard the NASA Ice, Cloud, and land Elevation (ICESat) satellite and from the PALS airborne instrument flown at various times from 2005-2009 over both the ground plots and the ICESat GLAS flight path. For a consistent biome-level analysis, ecoregions contained within the boreal forest biome were identified by the World Wildlife Fund's (WWF) ecoregion map of the world (Olson et al., 2001). Land cover maps were used to identify land cover types for stratification purposes within eco-regions. Land cover data for Canada were provided by the Earth Observations for Sustainable Development (EOSD) project centered on year 2000, with images from 1999 to 2002. The National Land Cover Data (NLCD) 2001 classification was used for Alaska based on data collected between 1999 and 2004. The ground-based measurements are not provided with this data set. Archived by National Aeronautics and Space Administration, U.S. Government, ORNL_DAAC. https://doi.org/10.3334/ORNLDAAC/1273. Margolis, H., G. Sun, P.M. Montesano, and R.F. Nelson. 2015. 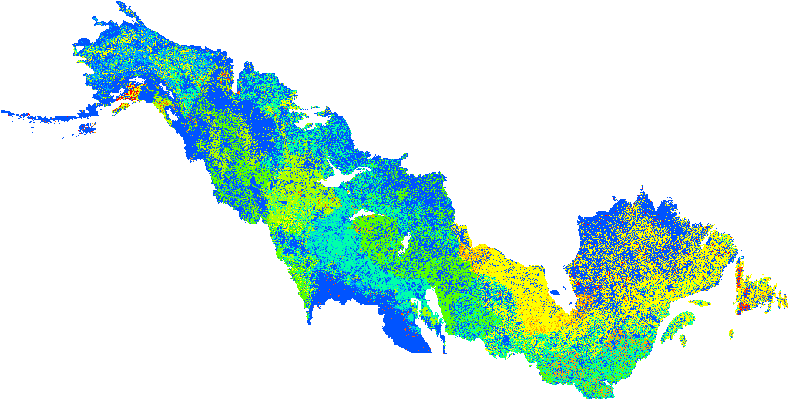 NACP LiDAR-based Biomass Estimates, Boreal Forest Biome, North America, 2005-2006. ORNL DAAC, Oak Ridge, Tennessee, USA. http://dx.doi.org/10.3334/ORNLDAAC/1273.